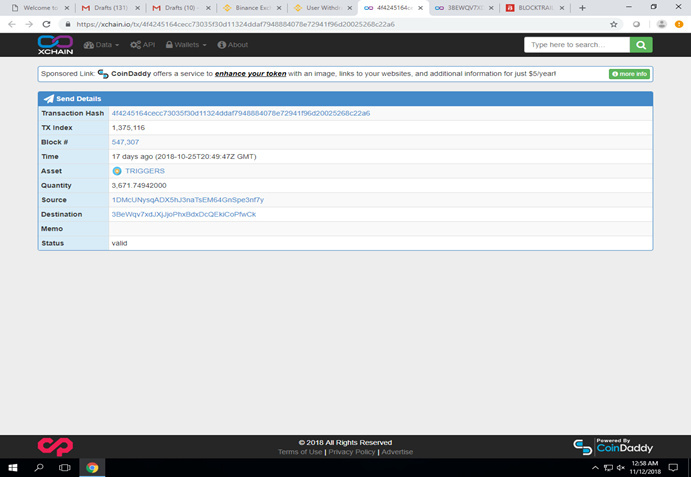 ,Have some TRIGGER and trying to transfer them from my counterparty Block explorer (XChain) but unable. Somebody help coz i see like my coins are decreasing. I tried to withdraw TRIGGERS from Binance and they ended up in Counterparty wallet and since then i have been having problem accessing them let alone withdrawing. I can see the record but how to withdraw them is a problem. Now I see a successful transaction of triggers. Can you access your counterwallet and see those triggers there? If true go to Counterwallet Exchange and trade Triggers for XCP.